This tweet sent stocks plunging in minutes. Luckily, the tweet was fake. A fake tweet from the account of the Associated Press sent stocks tumbling more than 140 points within minutes, erasing all of the day's gains and then some, before bouncing back just as rapidly. The erroneous tweet, which was posted around 1:07 p.m. 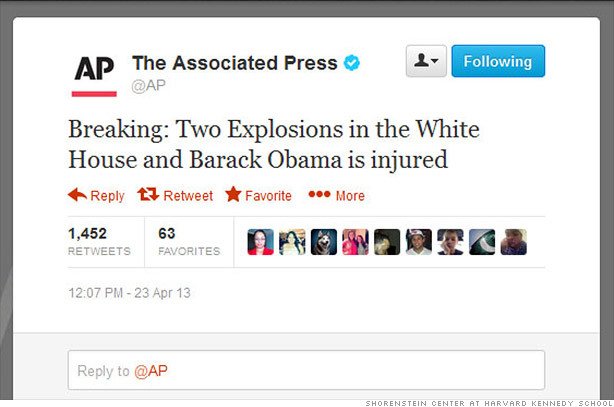 ET, said "BREAKING: Two Explosions in the White House and Barack Obama is injured." The tweet was up for a few minutes before AP's account was suspended, and presumably seen by many of AP's nearly 2 million followers. The tweet was also retweeted by almost 1,500 other Twitter users. By 1:10 p.m. ET, the Dow was down almost 13 points, or 0.1% on the day. Just prior to the tweet, the blue-chip index had been up about 0.9% for the day. Stocks fully recovered from the plunge a few minutes after hitting the low of the day, as investors realized the tweet had been made by a hacker and was not true. From its corporate communications account, AP clarified within minutes that the tweet was "bogus" and later elaborate that its account had been hacked and the tweet was fake. Still, the tweet briefly sparked panic and confusion, and raised questions about the power and influence of social media in global financial markets. We just found out how influential twitter is. A hacked tweet from AP (1.9 mln followers) and around 2 minutes equals 10 handles on $SPY. Questions were also raised about how the tweet would impact investors confidence, as many are spooked by the growing number of stock market flash crashes and high frequency trading. Dear #SEC... You wonder why investors don't have faith? Where does one draw the line on fake tweets and twitter hacks? Wonder if markets still sell off here. While it was a false rumor, it is a reminder of the world we live in. The tweet also raised the urgency for Twitter to improve its verification system. Really @Twitter needs to sort its act out, bring in secondary verification for all verified accounts, not hard - job done. Of course AP's twitter account isn't the first prominent one to get hacked. Over the weekend, the Twitter accounts of CBS's (CBS) 60 Minutes and 48 Hours were hacked, and the accounts remain suspended. And earlier this year, Burger King (BKW) and Jeep were among Twitter hacking victims.